Banks need to better leverage technology to address millennial-run small-business needs and expectations. Boston, August 17, 2016 – Millennial-run businesses account for only a small percentage of all U.S. small businesses, but they represent the future and are an important group for financial institutions to serve and understand. These businesses’ needs and technology expectations are often different from those of businesses run by older individuals. As a result, they are placing even greater pressure on banks—which are already struggling to keep up with small-business requirements—to evolve their strategies, product sets, and tools at a faster pace than ever before. Based primarily on the results of an October 2015 online Aite Group survey of 1,000 U.S.-based businesses generating less than US$20 million in annual revenue, this research highlights the needs of millennial-run small businesses and where they differ most from those of other similarly sized businesses. It also recommends six strategies financial institutions should implement to better serve these customers today and in the future. This 31-page Impact Note contains 29 figures and one table. 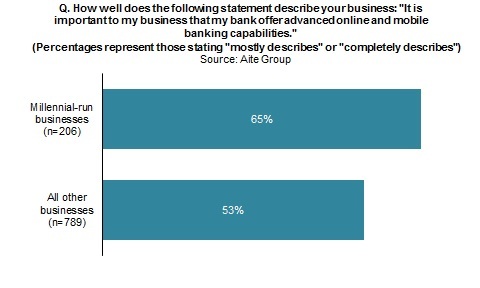 Clients of Aite Group’s Wholesale Banking & Payments service can download this report.